Benalauria Malaga - Getting from Malaga airport to Benalauria. 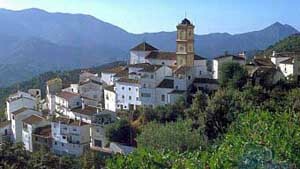 Benalauria is a municipality in the province of Malaga, situated in the Ronda mountain range, about 667 metres above sea-level and has approximately 500 inhabitants. From the village it’s possible to see Gibraltar and the North African coast. A visit to Benalauria is like a trip to the past where one can wonder around its narrow streets with typical white houses of Moorish influence. The town centre and its square host the town hall that dates back to the 18th century; strolling through the streets of Benalauria we’ll find beautiful views that contrast the houses and the mountains that surround the village. Benalauria’s name probably comes from the Berber tribe as ‘Banu al Auria’, who were part of the first expeditions that entered the Iberian Peninsula around the year 711. It was probably a small village where several families coexisted cultivating the fields until it was captured by the Christian armies, who added it to the municipality of Benadalid, the capital of the region. In the year 1570, Benalauria was inhabited mainly by Moors (Arabs converted to Christians that were allowed to stay). These Moors faced up to Benadalid, burning the Montemayor castle and the church, an act that wasn’t exactly a one-off, as it occurred throughout all of the territories conquered by the Christian armies, due to the great demands of these towards the Arabs; amongst these demands we must mention that the Moors could never have their house doors closed, they weren’t allowed to speak to each other in their own language nor practice any of their rituals; they were basically considered scum and this provoked the attempt of a final revolt, after which the vast majority of the Moors were expelled, and the area was repopulated by Christians brought down from the north. Later on in the 19th century, Benalauria became independent from Benadalid. To get to this beautiful white village in the province of Malaga, we have to head towards Manilva, passing by Estepona and Marbella. 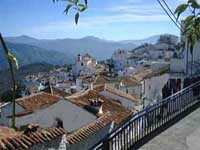 From there we head to Gaucin and follow the directions to Benarraba, Algatocin and finally we'll reach Benalauria. If you have any doubts, see our Benalauria route by car on the map below. If you need a car, do not hesitate in checking out our prices and offers for a cheap car hire in Malaga. Town council: Calle Calvario, 17, 29491. Official website: Ayuntamiento de Benalauria.